Reports and facts are exposed around the clock and yet the world’s reaction to the butchery that is happening in the Libyan cities is way too passive. At what point does it become reasonable for international intervention in Libya to stop the butchering of protestors? I can tell by now that if Qaddafi possessed a nuclear bomb he would not hesitate to use it against his own people. Qaddafi, the Satan of our history, is shocked and falling apart now. He never thought that Libyans would ever turn against him and demand the least of their rights. So he is now ready to retain power at all costs and win or die and leave behind him devastating damage and countless massacres. 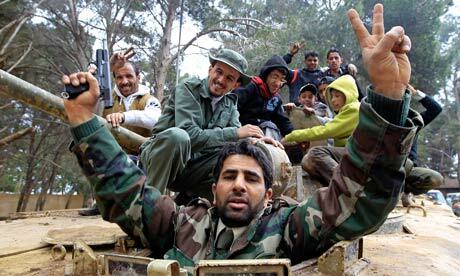 So far, Qaddafi and his sons keep showing the world that they are ruthless, desperate, with low IQs. They have made and keep making tactical errors, strategic ones, and most of all they commit crimes against humanity. What kind of leader says that his people are ‘cockroaches’ or ‘rats’ that have to be killed? What kind of a leader kills his own people every hour and every day? What kind of a leader uses bullets that are meant to shoot through walls at his own people? What kind of a leader ‘kills the martyr and then walks in his funeral’, through expressing his condolences for the heroes killed? How many more innocent Libyans will die before we take some positive action? The US and the EU are worrying about oil and business with Libya, while Qaddafi is finishing his own innocent and unarmed people with no mercy. I never thought I would see the day when oil prices were being debated at the cost of human lives. I’m utterly disgusted! Qaddafi and his sons are now desperate and panicking with meager planning or discipline and absolutely no strategy. There is no regime any more, only a gang of armed bandits fighting innocent people in the streets. Libyans will stand strong and Libyans will keep fighting for their rights until they win, or die trying. My friend called me earlier and told me that our heroic protestors may head tonight for peaceful demonstrations to the Bab Azziziya in the center of Tripoli – where Qaddafi and his filthy family are hiding like ‘rats’.